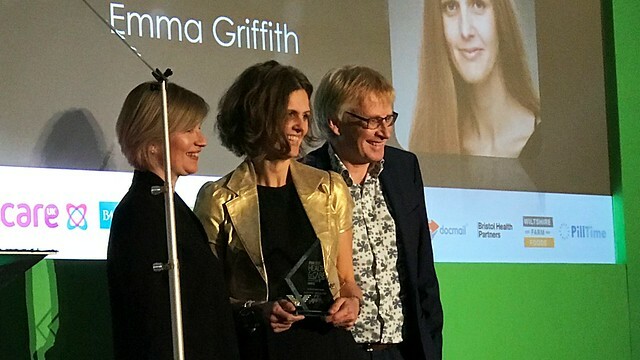 Dr Emma Griffith from the Department of Psychology has received the Research Impact Award, which was sponsored by Bristol Health Partners, at the Bristol Post and Bath Chronicle Health Care Awards 2018. The award recognises excellent research which will make a difference to people’s lives, whether it is evidence that will change practice in the NHS or public health or research into new treatments. Dr Griffith was shortlisted alongside her Bath colleagues Dr Liz Marks and Professor Alain Nogaret, as well as the Bristol Community Health Bladder and Bowel Service. She won the award for the qualitative analysis paper (Graham et al, 2018) of a feasibility Randomised Controlled Trial (RCT) (Graham et al, 2016) she co-authored earlier this year. The research was funded by the National Institute for Health Research/Research for Patient Benefit (RfPB). Dr Griffith completed this project with a leading research group at the University of Birmingham, which she has been a part of for over 15 years. The winning paper (Graham et al, 2018) evaluated a Brief Integrated Motivational Intervention (BIMI) the research group developed for working with individuals experiencing co-occurring severe mental health and substance use problems during acute/psychiatric intensive care inpatient admissions (Graham, Copello, Birchwood & Griffith, 2016). The research indicated that both inpatient ward staff trained to provide the BIMI and inpatients found the BIMI acceptable and feasible when provided in busy inpatient environments. Aside from her role as Lecturer and Clinical Tutor on Bath’s Doctorate in Clinical Psychology, Emma is also the Head of Therapies for Specialised Services and Consultant Clinical Psychologist in Dual Diagnosis (co-occurring mental health and substance use problems) for Avon and Wiltshire Partnership Mental Health NHS Trust. Dr Griffith and her research group have applied for funding to build on the feasibility work recognised by the award. The long-term aim is to have an evidence-based intervention delivered by trained inpatient staff as part of routine NHS care within the next three to five years that improves the treatment outcomes for individuals who experience co-occurring severe mental health and substance use problems.